1. What is the Albright Challenge? The Albright Challenge is a powerful tool for transforming your potential into extraordinary results faster than you ever thought possible! Over the course of the program, Andy Albright helps you to implement the best strategy for your business and personal life by teaching you the principles followed by the best of the best. The Albright Challenge will change the way you think and approach life. If followed daily, the Challenge will improve your focus, intensify your commitment, add discipline and order to your priorities, and most important, it will turn you into an unstoppable powerhouse. 2. What are the benefits of the Albright Challenge? No matter who you are, what business you are in, or where you live, you want to produce better and more consistent results. The Albright Challenge will give you the motivation to achieve your best. If you want to be a better leader, have better personal relationships, and have a proven track to follow, the Albright Challenge is for you. 3. What makes the Albright Challenge effective? 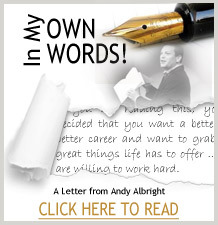 Andy Albright's teachings have propelled thousands to higher incomes and a more satisfying life and will do the same for you. The key is the daily consistencies Andy teaches. The goal-setting techniques and actions steps taught in the program have produced 7-figure incomes and no secrets are held back; they are yours for the taking! Periodic self-assessments will assure you are retaining the important methods for achieving your dreams, enforcing deadlines and stretching you to reach for more. 4. Who should participate in the Albright Challenge? Anyone who wants more out of life should take the Challenge. 5. Is there an ideal date to start the Albright Challenge? Today is the day to take charge of your future! If you want better relationships, more income or improvement in any area of your life, today's the day to start. 6. What's included in the Albright Challenge? Through Andy's trainings you will learn to dream bigger dreams and how to make them come true. The very first step Andy covers is an awesome goal-setting system proven effective by some of the most successful people across all professions. If you follow the system, you will not fail. 7. How much does it cost to participate in the Albright Challenge? Top executive pay thousands of dollars to learn these success principles that Andy teaches to you for just $199. So, for half the price of your daily stop at Starbucks you will have teachings from someone who know the secrets of success and freely shares them with you! 8. How much time does the Albright Challenge require each day? The first five days will focus on goal-setting and preparing your 90-day plan and will require a total of about 90 minutes. After the first five days, ten minutes a day is expected. Give Andy ten minutes and you'll start your workday alert, focused and motivated on the important tasks that will make each day more productive, more profitable, and more satisfying than you are used to. 9. How is the Albright Challenge delivered? Andy Albright's great team of technical and video experts has prepared the program to be delivered digitally through audio, video and text on your computer or smartphone. Wherever you are you'll have access to your lessons and Andy will coach you to heights you've never thought possible. If you are coachable you're in for the ride of your life because Andy will hold nothing back as your personal coach.